After a specially powerful opening of the Santa Clara Awakin circle with a new sister sharing her journey of being held by strangers, we listened to each other in the circle of sharing. As usual, there were other newcomers, two of whom were visiting all the way from China, Zilong's parents. When it was her turn to share, Zilong's mother said that she feels the warmth of everyone's shared stories and has a lot to say, but with a hesitancy over her English, she will simply appreciate the warmth and smiles. The lady sitting next to her immediately volunteered to translate from Chinese to English, so she could share fluently in Chinese. What are the odds that these two just happened to be sitting next to each other, to be able to spontaneously connect? At the end of dinner, Zilong's mother said to me that she understood my share had something to do with dance, as I indeed had talked about my two year old neighbor who has no shame in being held as we dance new moves together, till he is comfortable to do them without being held. She expressed that someday she would like to dance with me. Several people had already left, so there was actually enough space in the room. I held her hand and said why wait for someday when we can dance right now, right here. As we twirled around, Harishda came and said she was ready for her turn to dance with the visitor. As they ended their dance, she called out to Guri to take a twirl. And spontaneously, a few others came to join, and within a minute or two, all the women were holding hands and dancing in a circle. The men witnessed this organically emerging embodied connection and someone managed to take a photo. Dance helped us connect beyond the language, culture, age, ethnicity and all other barriers that we can't name, but carry with us. The sister who opened the circle smiled beautifully. We all left feeling we were held. As Harshida had said: sometimes we hold the circle and sometimes the circle holds us. Athithi devo bhaav - the Sanskrit saying says - the visitor is a blessing. It took Zilong's mother to visit all the way from China to set this magical moment in motion. 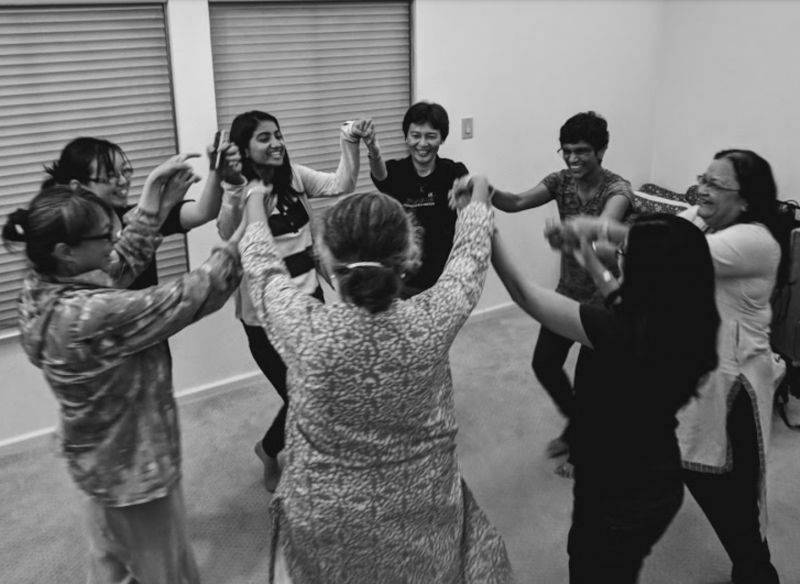 Dear Jyoti, thank you so much for allowing us to join your dancing circle from afar via your love and words! My parents have not stop talking about Awakin Circles since their first visit :) Much love and gratitude for welcoming them -- and us all -- home! Dear Zilong, thank you for allowing us to join your global travels from afar via your love and words too. The circles of sharing keep the heart connections growing. Gratefully and with blessings for you. Locating helpful data on a specific subject can give a migraine to many individuals. I am among those individuals, and I can't locate any valuable data. So, I have to rely on amazing authors like you to give me some good data. Superb article composed by you here. This article is positively a standout amongst the most stunning ones that I've perused on this site. I would love to see some more articles that are like this from you. A debt of gratitude is in order for considering to compose an article regarding this matter. That has certainly helped me with this task I am dealing with. I simply trust you won't quit creating progressively top quality articles later on. Much obliged to you for thinking about composition regarding this matter today. There's a great deal of helpful data in this article, and I can use the majority of it in my exploration paper. That makes me truly glad! Stunning! This must be a standout amongst the best blog entries that you've distributed on this site up until now. The substance is splendid, and it will help me in my undertaking, too. Couldn't have requested much else.